This book provides an in-depth understanding of key variables that play a significant role at the various stages of the innovation process, leading to successful commercialisation of products and services. 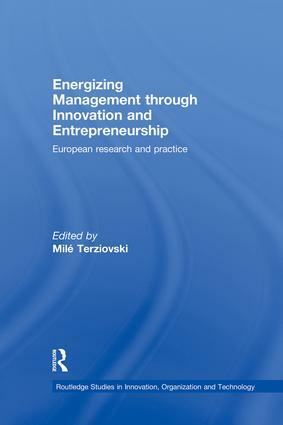 Combining interdisciplinary studies in entrepreneurship and innovation, the book consists of contributions focusing on theory, research and practise in the field of innovation, management and entrepreneurship. The role of the entrepreneur is addressed as an innovator who recognises opportunities and convert these into marketable products and services through personal commitment, financial resources and management skill; taking appropriate level of risk. Terziovski has selected a variety of chapters focusing on a wide ranging number of topics including corporate entrepreneurship, entrepreneurial learning strategies, the impact of entrepreneurial practises on competitiveness, human resource management and knowledge management. The main conclusion of the analysis in these chapters is that there is a strong relationship between innovation and entrepreneurship. Moreover, this book articulates two contradictory schools of thought; first that firms with a higher entrepreneurial orientation have higher relative international sales and operate in a greater number of foreign countries; and secondly that entrepreneurial orientation is not associated with subsidiary financial or market performance, but is positively and significantly associated with subsidiary idea generation which are subsequently converted into marketable products and services through the innovation process. This book acts as a negotiation between these two perspectives. International entrepreneurship in established ﬁrms: does it matter?